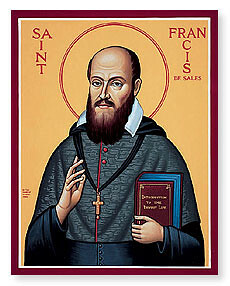 January 24 is the Feast of St. Francis de Sales, Bishop and Doctor. 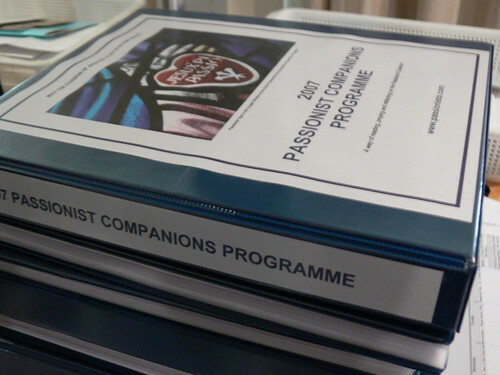 The 2007 Passionist Companions Programme aims to provide our Passionist Companions with material centred around the Passionist Charism. Many of the Companions, professed and lay, have already been exposed to the Passionist Charism and Spirituality during Passionist Institutes and have asked for resources to enable further prayer and reflection on the Charism. This year’s programme reflects on the life and spirituality of St. Paul of the Cross, from the writings of St. Vincent Strambi; provides material on the Passion of Jesus in the Gospel of St. John; and reflects on the influence of St. Francis de Sales on the spirituality of St. Paul of the Cross. 2007 Passionist Companions Programme coming soon! The 2007 Passionist Companions Programme will be available soon. For Saint Paul of the Cross, the Passion of Jesus is the clearest expression of God’s love. Paul looked at the person of Jesus; he wished to be an image of Jesus, his Crucified Love. He gathered companions to announce and keep alive the Memory of the Passion of Jesus, the sign of God’s saving love for his people. Paul of the Cross invites us to three things: to meditate on the sufferings of Jesus; to find meaning for our life through the Passion; to bring this meaning to others, inviting them to keep the Memory of the Passion of Jesus alive in their hearts. All our daily prayer, meditation, community life, and apostolate is an attempt to live and practice the Passion of Jesus as sign of God’s love, as Saint Paul of the Cross did. 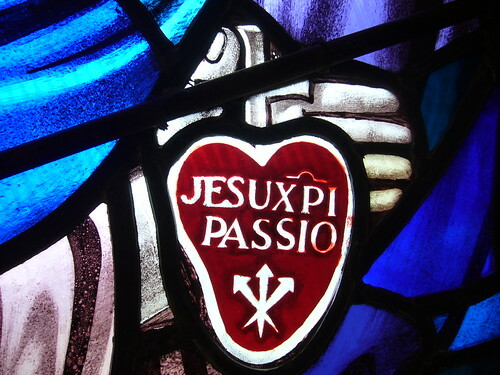 The Passionist Charism is rooted in the experience of Saint Paul of the Cross; central to the Charism are the Passion of Jesus and the passion of humanity and of the earth. Our Charism is expressed clearly in the Constitutions and documents of Chapters. The Passion of Jesus reveals the love of God for humanity. The logos of the Cross becomes the manifestation of the passion of the Father for humanity; thus, the Passion is the centre, the motive for our life. The love of God revealed on the Cross gives meaning to life; it gives meaning to our life. The Memory of the Passion is the source and foundation of our lives as Passionists; this is what gives us our identity. This Memoria Passionis offers a meaning to life that is profound and enduring; it helps us to discover meaning even in situations of suffering and pain – moments that often appear to be devoid of meaning. The Charism of Saint Paul of the Cross helps us to celebrate life in the midst of death. The two dimensions of the Charism are identification with Christ crucified and being present to the “crucified” of today. The Passionist Charism is not so much to be defined as to be lived and experienced, through contemplation, community life and mission; it is about loving, not about doing. The Charism is a gift, but it also brings a responsibility. When it is lived in a serious way, it calls us to a transformation not just of our personal lives, but of the very structure of our Congregation. It is this light, the power of the Cross, which can transform our lives in a real way. We have personal experiences which incarnate the Charism: being with the persecuted, the struggle for justice, the memory of the Crucified and the “crucified”, the centrality of the Memoria Passionis, pastoral life, prayer and contemplation, the encounter with Christ and the experience of being loved, the experience of peace and of suffering in the world. The Passionist Charism is a living reality which is dynamic, not static; this reality implies:– the call to keep alive the Memory of the Passion which draws us to this community; the gift and challenge of life in community which leads us to deeper insight into the meaning of the love of God revealed in the crucified and risen Jesus; our experience in ministry, particularly with the poor and the crucified of today, which further deepens that insight and calls us to ongoing conversion; our struggles with our own personal pain and weakness which also invite us to embrace the Crucified One with greater openness and intensity. The full richness of the Passionist Charism is found in community, for the Charism is not so much a reality of the intellect as it is about life and witness. We live the Charism, then, in our relationships: in our relationship with Jesus; in our relationship with our brothers in community, especially the young, the elderly, the sick; in our relationship with those to whom we minister, especially the most neglected and those who suffer; in ecumenical relationships which minister to the sufferings of the church caused by the absence of unity. As Passionists, we are called to form relationships with the crucified of today, relationships that reflect the compassion of God revealed and effected in Jesus Christ. These relationships are sources of new life and healing for those we serve and for us. Our ministries give expression to our Charism but they are not, in and of themselves, the Charism. The Charism is a deep life force which expresses itself in a variety of ministries. It gives rise to a particular concern (a preferential option) for the poor, the marginalised, those searching for meaning, the endangered earth. The Passion of Christ illuminates certain aspects of life today and gives them meaning: situations of poverty, the need for solidarity, the struggle for justice, respect for the other, dialogue with other religions. We can reflect on how the Passionist Charism is incarnated in the diversity of cultures and social situations in which Passionists live and minister. We must continue to find ways to proclaim the kenotic love of God manifested and effected in the Crucified One to people of all cultures, while also allowing them to proclaim this same message to us.We can collaborate to eliminate social and economic structures which delay the building up of God’s kingdom. Our Constitutions (number 65) give a synthesis of the relationship between our Charism and our Mission. In living our Mission, we do not lose sight of the “life like the apostles”, the community dimension, and the balance between contemplation and mission. We need to be aware of what can cloud our Charism’s visibility and know how to respond to it. Often we think we are living the Charism, but people cannot see it. If we witness to the message of the Cross without responding to the basic needs of the people, our witness can be difficult for others to understand and accept. We need to ask ourselves what kind of witness our lifestyle gives to ordinary or poor people. The Passionist Charism has a great potential, but at times it can be difficult to continue being creative with it. We have today a number of generic apostolates where our Charism is less clear, but we can also carry out even our most characteristic ministries, in ways which do not communicate the Charism. As well as accompanying people in their suffering, we need to learn how to live solidarity in situations of the absence, the silence of God. Our Charism is for mission, but mission is not just activism; it implies presence. Presence with others and to others is a way in which we promote the Memoria Passionis. It is easy to speak about the Charism, but difficult to live it; we are called to accept it every day in living faith. We need to make the journey from the head (idea) to the heart (life). Our Charism is not a philosophy; it is about a person (Jesus Crucified). We need a revitalisation in our Charism, intensifying our relationship with the Crucified One, which will make our witness more credible. We cannot proclaim the Passion to others if it has not penetrated our own lives. Looking at our own personal experience, we know that the origin of every vocation is mysterious; it is God who calls. In our own vocation story, there was often the example and witness of a Passionist; their contemplation of the Passion of Jesus marked them out and drew us to them. When we joined the community, we deepened our love for this way of life and increased our commitment to the Memoria Passionis. We are beginning to rediscover the Constitutions, their beauty and richness; we can profit from reading them in a prayerful way. In the Constitutions, we find a beauty and power of expression in relation to our Charism. Values that are specifically Passionist are found there, and it is important that we continue to meditate on the Constitutions in order to understand and live these values. Values which enable us to continue to live the Charism include prayer, solitude, penance, and poverty. In fact, they help us not only to live the Charism but also to be recognised within the Church as Passionists. Young people today seek clear visible signs of identity within religious life. While we are called to internalise our Charism at a deeper level than just the external, we need also to find appropriate external expressions. Schools of prayer are an important way of communicating the Charism, especially to young people.